The players at the American University of Iraq-Sulaimani are the subject of a documentary called "Salaam Dunk." Happy International Women’s Day, everyone! It’s pretty much mandatory that feminist bloggers note this day – and why not? It’s a pretty important day if I do say so myself – and so I’ve decided I’d like to jump in with something I’ve been thinking about for a while now, which is the way that sports and athletics can be a liberating force in the lives of girls and women, not just in the United States but all around the world. I’ve shared my own stories quite a bit on this blog: how running helped me heal after leaving an abusive relationship, how playing sports in church leagues helped me become more comfortable with my height, how playing sports in high school gave shape to my identity in a way that wasn’t predicated entirely on being pretty. It’s a consistent theme that runs throughout much of my life. While I recognize that this isn’t true for everyone – a lot of people found athletics to be a source of shame and anxiety – I’ve come across many stories that are similar to mine in this regard. And they aren’t just from ladies like me, coming from lives of relative privilege in the Western world. I’ve read about women’s basketball in countries like Somalia and Iraq. I’ve read about women’s soccer in Iran. I’ve read about women’s boxing in Latin America and also among some of the rougher parts of society in the United States. The women love to play. They will play in frigid temperatures, in poor facilities, under the threat of death from fundamentalists, against the wishes of their family, against the constraints placed upon them by society. They do it because they love it. Sports led to a domino-effect of sorts, where the women found themselves thriving on the court, then that sense of personal empowerment bled over into the rest of their lives. The study based on interviews with female athletes and their coaches found that sports often empowered young women whose role models are successful sportswomen like Fatima Al-Nabhani, an Omani tennis player, and Bahraini sprinter Roqaya Al-Ghasara, who was fully covered when she ran and won at the 2008 Beijing Olympics. “Both women not only serve as role models for aspiring female athletes from the region, but also shatter Western stereotypes,” the report said. She was tested early, hauling stacks of firewood and jugs of water as a young girl in the village of Kapsait, about 200 miles northwest of Nairobi. She was under the thumb of a father whose pores excreted chauvinism, a man who had four wives and thought each of them was put on this earth to scrub and wash. It was a coup for the family just to persuade him to let Ms. Loroupe receive an education. Sometimes, he would pile so many morning chores on her narrow shoulders that she would be late for school. So she ran. And ran. And ran. “Those teachers would beat you if you were late,” she said. It was about five miles to the schoolhouse door, and that dirt road became Ms. Loroupe’s first track. When she took up running, it was with the support of no one but her mother. She not only went on to become one of the finest long-distance runners in the history of the sport, but she also founded an organization, the Tegla Loroupe Peace Foundation, that incorporates athletic training into conflict resolution programs. I find Loroupe tremendously inspiring, not just as an athlete but as a human being. In fact, Loroupe is just one of many women who used her athletic prowess as a launching pad for activism. In running alone I can think of Kathrine Switzer, Nina Kuscsik, Grete Waitz. There are so many more, more than I can even list off in this single blog post. When you play sports, you not only learn to see your body as a source of strength and power, but you also develop discipline, dedication and perseverance. You have to face fear and find a way to prevail. And you learn that you are much bigger, much more expansive than the teeny little role assigned to you at birth by your culture. For most of us, those things do not leave our bodies the second we step off the playing field. We carry them into our interactions with our families, our coworkers, fellow community members, our cultures, our institutions, which are then changed by us. The personal is political, all right. When we are changed for the better, we are better able to change the world. ← Help me raise money for Girls on the Run! Great article! 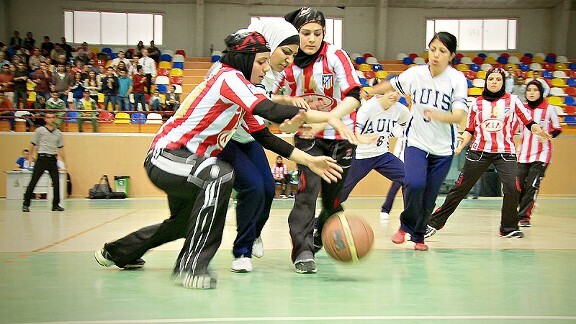 I love this idea of women being empowered through sports. Had not read about the hijab either, interesting to learn about this.